• Half of all UK students rent accommodation from a private landlord. • 31% of students find their studies affected as a result of their living arrangements. 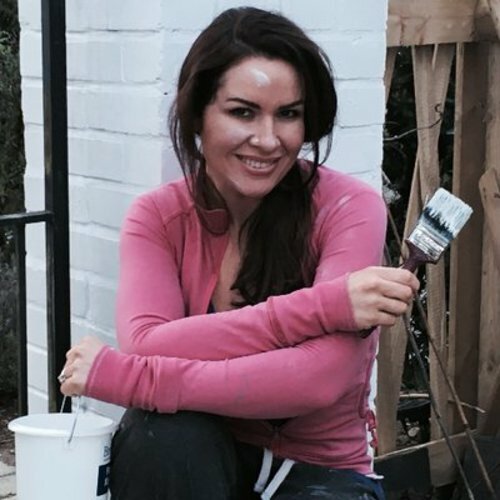 • BBC Presenter, DIY Expert and National Home Improvement Month Ambassador Georgina Burnett gives her top tip on how students can transform their dirty digs into a study sanctuary. Student housing is notoriously known for beer bottle lawns, mismatching interior design and unhygienic conditions. A 2018 survey by the National Student Accommodation established that half of all UK university students live in the private rental sector, making it the most popular form of student accommodation. With studies highlighting the importance of having a comfortable and welcoming studying environment in order to achieve good grades, many students are keen to adapt their house into a serene study sanctuary but complicated tenancy rules and regulations are major home improvement deterrents. National Home Improvement Month research has revealed that more than 1 in 10 18-24 year olds in the UK feel ashamed and claustrophobic in their own home and with the average student age demographic between 18 and 24 many of these attitudes are the reflection of students. The survey further uncovered that 18-24 year olds have relatively undeveloped DIY skills ,with 33% feeling uncomfortable to even hang up a photo, 52% being unsure of how to put together flat pack furniture and the majority of 18-24 leaving DIY tasks to a more competent family member. Expense and inexperience were also found to be the main reasons students were reluctant to make home improvements. For Student tenants that scroll through social media for interior design inspiration and are desperate to dust off their parents tool kit, Rose Jinks, the Spokesperson for 5 Star rated Landlord Insurance provider Just Landlords, explains how student tenants should go about making improvements to their rental accommodation: “The type of DIY that you can and cannot complete in your rental property should be stipulated in your tenancy agreement; there will usually be a clause stating the improvements you are or aren’t permitted to make. For students anxious about the looming exam season , BBC presenter, DIY expert and National Home Improvement Month ambassador Georgina Burnett provides her cost cutting and simple DIY tips to help maximise grades. First things first, my experience of student housing was that it never really felt clean, even from day one. This should be your first task and you and your housemates could make it fun by doing it all together, with some loud music and maybe a few drinks. If you give the place a thorough scrub you will be more likely to keep it clean whilst you’re living there. Clutter can be distracting when you’re trying to study and it doesn’t have to cost a fortune to add some storage solutions. You can pick up some items of furniture for as little as a fiver from a charity shop and upcycle them to modernise and add your own stamp. If the walls are really grubby and depressing you should ask the landlord to have them repainted and if they aren’t keen you could offer to do it yourself. Shades of green are known to improve concentration due to the colours low wave length creating a calming atmosphere. While tones of orange are mood lifters that promote neural functioning. Just make sure you do a thorough job so you don’t lose your deposit! If you have brown swirly carpets it might be worth investing in some plain throws from charity shops to put on the floor as this will at least cover the eye-sore and enhance the room. The same goes for 90’s floral sofas. Then when they get grubby you can just bung them in the washing machine. You might even find your local charity shop helps you to replace tired curtains for next to nothing. The best way to add character to a room is via the walls and with peel-away wallpaper and stickers you can do this in a quick, easy and affordable way without losing your deposit. Plants can make a big difference to the look and feel of a home and you can take them with you to the next pad. If you don’t trust yourself to keep them alive its worth investing in faux flowers and plants, which you will probably still be using way past your days of studying! It’s a good idea to have some live greenery though as it’s known to improve your mood and air quality. This press release was distributed by ResponseSource Press Release Wire on behalf of Kin Communications2 in the following categories: Home & Garden, Education & Human Resources, Construction & Property, for more information visit https://pressreleasewire.responsesource.com/about.